Gautam Lewis has had the sort of life that could spring from the pages of a fairy tale. 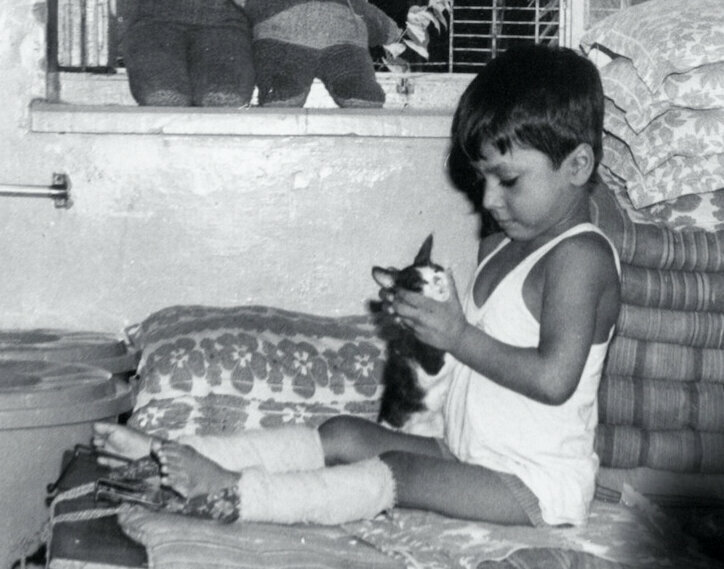 Afflicted with polio at 18 months, he was taken in by Mother Teresa when he was 3. He doesn’t know all the details of how he came to live at her Home for Children in Kolkata, but he does speak of the courage his family must have had to give him up. At age 7, he was adopted by Patricia Lewis, who had first met him when she was a physics Ph.D. student volunteering in Kolkata. She is now one of Britain’s leading arms control experts. Gautam was taken to London and educated in elite institutions, like Hill House, the prep school of Prince Charles. 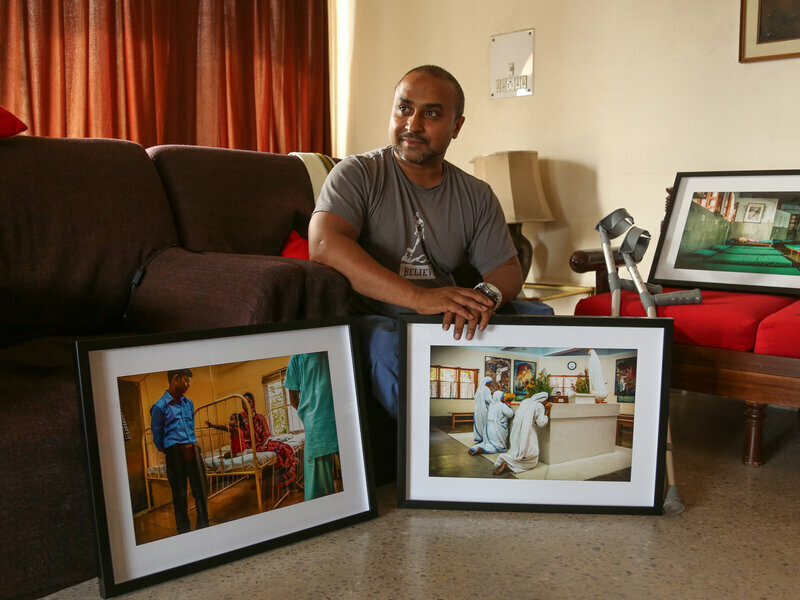 On the occasion of the canonization of the woman he calls his “second mother,” Gautam Lewis will be in Kolkata to exhibit a series of photographs depicting Mother Teresa’s life — and his own childhood — and to premiere a documentary he made called Mother Teresa and Me. In the film, he visits the orphanage where he once lived and chats with the children he calls his “brothers and sisters,” who live there now. Lewis shares with them the joy he felt flying kites from the rooftop. “I used to go upstairs onto the roof and fly a kite. And now I have learned to fly airplanes as a pilot,” he tells a wide-eyed little girl strapped into a wooden frame that is helping her stand. She’s one of 110 children in the center. Lewis himself is on crutches. “You are the pilot of the sky,” she declares, sounding almost skeptical. “You don’t believe me,” Lewis says. “I believe you!” she exclaims. Lewis, now 39, is in fact a certified pilot. His fascination with flight was a longing to feel lifted from his polio-induced disability. He learned from an ace Royal Air Force pilot. He now trains other people with disabilities to fly, through Freedom in the Air, a not-for-profit he founded that he says is “about challenging stereotypes.” He was named an ambassador last year for the Douglas Bader Foundation, which promotes the welfare of people with disabilities and is named for the double amputee Royal Air Force pilot who flew aerial victories in World War II. In pursuing his dream to take to the skies, Lewis says he has followed advice Mother Teresa gave him in a private Mass, just months before she died in September 1997. “Nothing is difficult, but just different,” Lewis recalls her saying. And she added: “If you can’t find someone to help you do whatever it is you want to do, just do it on your own.” He says he has applied her wisdom throughout his life. There was, however, a long period when Lewis distanced himself from the part of his childhood associated with Mother Teresa. “I don’t have the same childhood most children would want to have,” he recalls. “Obviously [there was] love, because of the care. But in terms of education, kindergarten, playtime, exploring the world, being a child — it wasn’t there.” Instead, there was painful corrective polio surgery and feelings of loneliness and isolation. He recalls crying for hours at the orphanage. When he overheard a nun saying that no one from his family would ever come to get him, he stopped talking for six months. Mother Teresa called in a psychiatrist to help — and, he says, she remained a watchful guardian during that dark period. Lewis underwent a half-dozen corrective surgeries after contracting polio at 18 months. His treatment, under the care of Mother Teresa’s Missionaries of Charity, included the straightening of his legs with weights strapped to his limbs for six months (pictured above). Lewis did not see Mother Teresa on a daily basis but he says she always checked in “on her children.” He especially recalls Sundays, when she would come and get them, “dressed up in our best clothes” and take them to the chapel for Mass. Lewis’s transition from being “one of the India’s poorest” to being “one of the lucky ones” was fraught. At school with the children of rock stars and royalty, he pretended that the first seven years of his life didn’t exist. “I hid the truth from them. I didn’t want them to tease me because I was not like them,” he says. At 18, during his “gap” year before starting college, he traveled back to Kolkata in the company of his adoptive family and close friends. The trip triggered a flood of buried memories and an identity crisis. Lewis had been working in the music industry, managing top bands in Britain, including the Libertines, Hives and The Kills. He gave that up. From handling edgy musicians he went on to administer polio vaccinations to India’s poorest, helping those as deprived as he had once been. He has also recently restarted his music management career.His first project is an homage to Mother Teresa. Lewis chose to skip an invitation from the Vatican to attend the ceremony making Teresa a saint. Instead, he will be in Kolkata, her city and his, to honor her legacy through music. The onetime band manager has scouted local musical talent and brought a young hip-hop collective called the Cypher Projekt into the Mother Teresa project. He has worked with them to produce an original song titled “Mora Gaang — Salvation for the Soul.” The proceeds from the song will go to nonprofits that work with street children in Kolkata. He hopes the music will help introduce Mother Teresa to the next generation. That this abandoned child has been able to see the world — and soar into the skies — and has known the support and embrace of a family is testament to the power of Mother Teresa’s work.